My first child slept only when being walked in the sling. After much effort and a lot of tears (mine and his), he agreed to give my back a bit of a break and take the occasional nap in a pram. Together we prowled the fringes of Tower Hamlets and the City of London. In my new-Mum uniform of jeans and tunic tops, I side-stepped the suited people hurrying from tube to office to wine bar to tube, forgetting that I used to be one of them and that, once, they might have been me. I walked the length of Bishopsgate to the Monument, marvelled at the emptiness of Borough market during those hours when all the office lights in the surrounding buildings blazed, strode down to the Waitrose at Wapping (my target – not often achieved – was always to get through the check-out before the baby woke) and often ended with a cheese and marmite pancake for me in Spitalfields market. Then we moved and, I found new places to walk. At first, there was the park and the streets of elegant terraced houses surrounding it, the water meadows and the Georgian streets in the College-side of town and, eventually, I found Winnall Moors. Originally owned by the great Hyde Abbey in medieval times, later developed as flooded water meadows in the seventeenth century and now a nature reserve, it is still hushed perfection. With no dogs, no cyclists – frankly, few other visitors at all – and only the wind twisting through the bulrushes and the call of the sedge warblers, it hardly seems just ten minutes from the city centre. In the summer, male banded demoiselles, in the metallic blue of a tin soldier’s livery, court the iridescent green females. Swans nest on the path and water voles, with luxuriant grassy moustaches make brief riverbank appearances. Once, on an autumn afternoon, I saw a young fox. He stood, paw poised in what I imagined to be horrified disbelief, before skittering back into the rushes. When the first child was joined by the second, I made occasional forays with both children, stacked like pancakes in their double pushchair. They synchronised their naps only rarely so, with at least one child crying or chattering, the days of the foxes and voles seemed over but then, one winter, we saw a line of deer, slipping like shadows across the path. 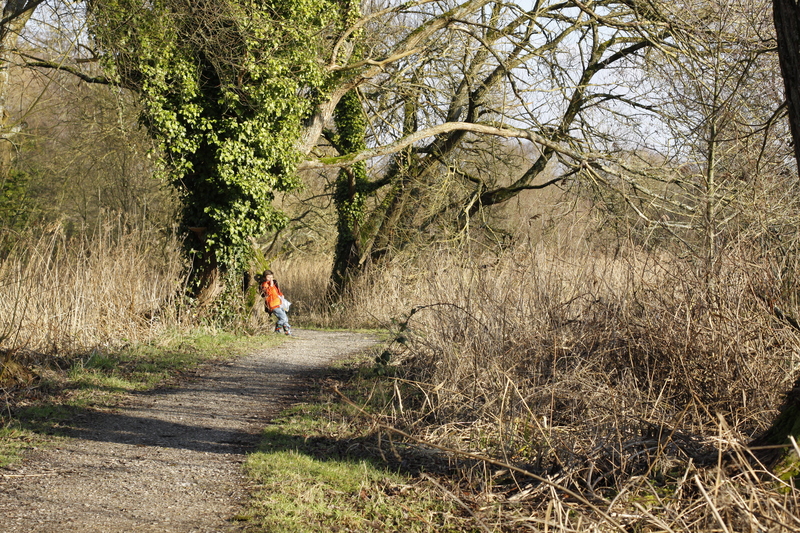 Now, the children stamp and clatter along the boardwalk, pretending they’re explorers in a tiger-filled swamp. My daughter no longer mistakes the Highland Cattle grazing nearby for horses but I remain wary. This is the child who once said, ‘Oh, it’s a lion!’ as we watched an otter disporting itself at twilight. And so still we look: at the heaving mass of tadpoles in spring, at the coot families, at the changing colours of the trees in this place that has allowed us to slip into it as if we’ve always been there. You’re right: no pups of whatever size allowed in Winnall Moors. I suppose, if there were, the swans wouldn’t nest on the path and the deer would take care to hide themselves better. Very lovely writing. I love the nature stuff too, but also the ‘children stacked like pancakes’. Hi Louise! This is so lovely, you have such a talent for descriptive prose 🙂 When my little one was small she would only sleep in her pram during the day and so I spent hours wandering the back beaches where we lived. It was a lovely time, in many ways and your post has brought it all back.